Greetings from the Columbus Metropolitan Library! Well, I've had two updates since the 7th but since I've been scurrying in and out of my apartment, the rain, and everything else that makes internet/computer use hard to achieve I haven't noticed until now. So, you know, neat. Anyways, my Threadless t-shirt finished scoring (hopefully anyone who visits here already found it from somewhere else and scored it) at a 2.22/5 out of 536 votes. I guess I'm just waiting on an e-mail from Threadless to see where it goes to now. I have no idea if that number is high or low or anything regarding whether or not it'll get printed. But here's hoping. I said in one of the posts that I'd update every Sunday. Then I moved to my new apartment without internet and realized that was going to be problematic. So I'll update when I can or have something to share, but when I do get reliable internet at my apartment, I might take up that Sunday update offer again. Anyways, I have a recent freelance opportunity that I found helping someone with illustrations for a Fresh Step cat litter campaign they were copywriting for. So that's cool. Also, I've been hitting Cowboy Mummy real hard recently. I go to a park near my apartment and sketch everyday and it's been just Cowboy Mummy stuff. Without the internet, it's hard to work on the Cowboy Mummy blogspot so maybe I'll scan them in and present them here until then. We'll see. 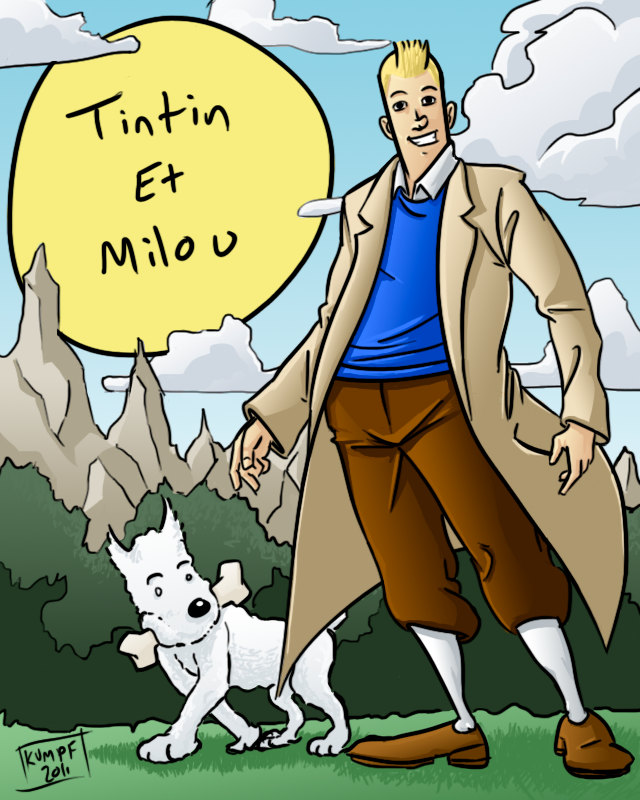 But for some actual art we have Tintin. Came across the trailer for the movie awhile back, which then had me read some of the comics again, so I had to get an illustration out of my system. And we'll see if I darken his hair colour, it got a little more yellow after a few shade changes.